Osomatsu-kun is a manga series by Fujio Akatsuka which ran in Shōnen Sunday from 1962 to 1969. It has been adapted into two different anime series of the same name, the first in 1966, produced by Studio Zero, and the second in 1988, produced by Pierrot and aired across Japan on Fuji Television and the anime satellite television network, Animax. This series helped establish Akatsuka's reputation as a gag comic artist, long before his other popular manga, Tensai Bakabon. 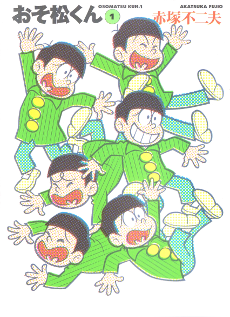 Osomatsu-kun has appeared in numerous special issues of Shōnen Sunday. Akatsuka has also included several manga adaptations of routines from Charlie Chaplin movies in the series. Won the 10th Shogakukan Manga Award in 1964.